Surrealism, with its roots in the Dada movement, depicted the world of intuition, dreams and the unconscious. The poet, Andre Breton, the founder of surrealism, “imbued the word with all the magic of dreams, the spirit of rebellion and the mysteries of the subconscious.” (Megg’s, 262) Looking at works by Salvador Dali during the surrealist movement, we can analyze his sense of depiction and representation of ideas drawn from the unconscious mind, his studies of Sigmund Freud and his fascination of the sciences. Surrealism is a cultural movement with roots in Paris that began in the mid-1920s as an expression of the philosophical and revolutionary movement that occurred post World War I. Andre Breton is characterized as the leader of the movement, writing the Surrealist Manifesto in 1924. During World War I, Breton used his training in medicine and psychiatry to serve as an aid in a neurological hospital where he, “used the psychoanalytical methods of Sigmund Freud with soldiers,”(Nadeau, 78) who suffered from severe trauma. Breton defines surrealism as the method, “by which one proposes to express, either verbally, in writing, or by any other manner, the real functioning of thought. Dictation of thought in the absence of all control exercised by reason, outside of all aesthetic and moral preoccupation.” He states that, “Surrealism is based on the belief in the superior reality of certain forms of previously neglected associations, in the omnipotence of dream, in the disinterested play of thought. It tends to ruin once and for all other psychic mechanisms and to substitute itself for them in solving all the principal problems of life.” (Breton, Surrealist Manifesto, 1924) The surrealists deemed the responsibility to create a representation of unconscious thought, a depiction of the solutions to the problems of life. Salvador Dali, born in spain, officially joined the surrealist group in the Montparnasse quarter of Paris. “The surrealists hailed what Dalí called the Paranoiac-critical method of accessing the subconscious for greater artistic creativity.” (Llongueras, Dali 2004) Dali’s entire persona wreaked of unique traits like his flamboyant double curled mustache, to the outfits he wore to balls and lectures in his effort to gleam representations of his studies of thought. In 1934, at a specially recognized, New York, “Dali Ball,” he wore a glass case around his neck, containing a brassiere, however, not nearly as representative as in 1936, when he lectured at the London International Surrealist Exhibition, wearing a deep-sea diving suit to show that he was “plunging deeply” into the human mind. 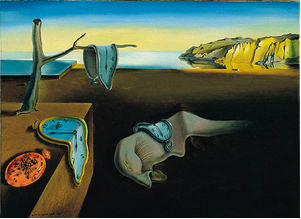 In 1931, he created one of his most famous works, called The Persistence of Memory communicating the symbolic metaphor that time is not rigid or deterministic. Images in the foreground of the work depict melting clocks, ants and flies devouring watches, the face of time draped in the sand, slowly fading in shadows. 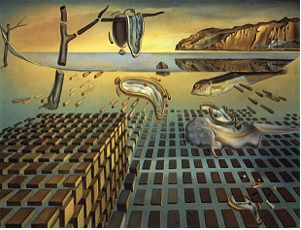 The representation is intentional in nature, Dali depicts the soft clocks against a rigid line of perspective, giving the insight that time is not constant or set, that it is only a creation of the moment and our interpretation of it. The line of perspective leads the eye to the icy background of the painting which is bathed in sunlight and contains depictions of an uphill climb. These symbols remain constructionist in their representation of time and space in the sense that the message communicated is understood differently by each individuals cultural and perceptual framework. What I draw from the background is the idea that there is light in the distance, that the future is unthawing and we continue to climb those hills each day of our lives, but currently we remain in the shadows of our construed perception of time that is melting in the moments around us. In the surrealist works of Dali, he aims to depict to the viewer his understanding of science and reality, of concepts of life that are unexplainable by science. These concepts are communicated to us with reflective symbols that have representations to meanings naturally drawn to objects such as watches, trees, sand, ice, ants, flies, drapes, etc. Mimetically we understand that these things represent time, time passed, future, the sands of time, and through the placement of these objects against the context of the background we begin to unearth Dali’s response to the subject. Interestingly against the context of his 1931 work The Persistence of Memory, is his 1954 work The Disintigration of the Persistence of Memory. Dali was always fascinated by science. In the twentieth century, came the birth of quantum mechanics and a deeper understanding of physics. For Dali, stood the challenge of communicating the ideas of Freud’s interior world of psychology and the unconscious, against Werner Heisenberg’s Uncertainty Principle and the exterior world of physics, which he depicts in his 1954 work, transcending the concept of time and ushering in the new world of physics. The interpretation of the latter work, become much more constructionist in its representation. He veers away from the literal objects of the first and moves into the direction of metaphorical and subjective. Speed and time seem to be more organized, but the subconscious entangles and floats within and through them, becoming skewed and interpretive. Megg writes of Dali’s significant contribution to the study of graphic design in two instances. The first being that Dali influenced designers to bring a level of depth to a two-dimensional surface that was not previously used in art. The second being, “his naturalistic approach to simultaneity.” Moving away from the psychological and scientific manner of Dali’s work to the stylistic approach, we delve into the world of coexistence. In almost all of his work, it was typical for there to be multiple contexts and perspectives, multiple characters and multiple images that can be interpreted at the same time, such as in his work, “Le grand paranoiac” which resembles many bodies huddled around each other, while at the same time, the image of a face rests on the sand. Simultaneity can be defined as, the quality of having two or more things happening at the same time. The idea is strongly rooted in Dali’s interpretation of the psyche, that depending on our understanding and perspective, we will draw out what the reality is, when there are two interpretations for the same representation. The concept has its origins strongly in the surrealist period, and is still very much used today. On what would seem to be a completely unrelated note, but is heel deep in the same context would be logo design today, for example. The idea of simultaneity shows itself in slippery marketing, where you see in subconscious strategies of today, like the FedEx logo, with the simultaneous image of an arrow and the typography of the E and the x. This strategy is used as a metaphor and a method in many areas of graphic design today, where images hide in negative space, whether they are subconscious or blatantly obvious, they draw on the mannerisms of Dali’s surrealist concept of simultaneity as well as can be argued, either the constructionist approach of representation in cultural codes or an artist’s intentional placement of symbols. Through surrealism, led by Andre Breton, through Sigmund Freud’s theories of the unconscious to Dali’s understanding of the ideas drawn from them all, we can see how the subconscious can be depicted through its representation of time, space and science. Though an artist such as Salvador Dali can intentionally imbue his own meanings within the context of his work, a constructionist representation is constantly present due to the nature of psychology and cultural understandings of surrealistic content. Breton, André. Manifestoes of Surrealism. Paris. 1924. Nadeau, Maurice. History of Surrealism. Cambridge, Mass. : Belknap Press, 1989. Llongueras, Lluís. Dalí. Ediciones, Mexico. 2004.